In many places kitchen is a heart of the home. When you are spending most of your time with family in there you want to feel good in that place. You want to be comfortable and have a space for every member of your family. As you already know it is not always possibile. When you have a small home, you probably have not big size kitchen. And this is where the problem begin. But you do not have to be worry, we have a couple of great solutions. White paint reflect light, so it can make your kitchen feel open and airy. Use similar white tones on kitchen cabinets and countertops. By keeping everything in the same color family, you avoid sudden shifts from dark to light and create the illusion of boundless space. A dark kitchen can feel gloomy and small. Install kitchen lighting over, below, and inside cupboards to make the kitchen space appear bright and airy. Pendant lights can be used to highlight the beautiful focal point of your space. It may go without saying, but the quickest and easiest way to make your kitchen look bigger is to clean up any clutter. It will make your kitchen feel more breezy, keep kitchen counter space clear and store appliances in the pantry or cupboards. 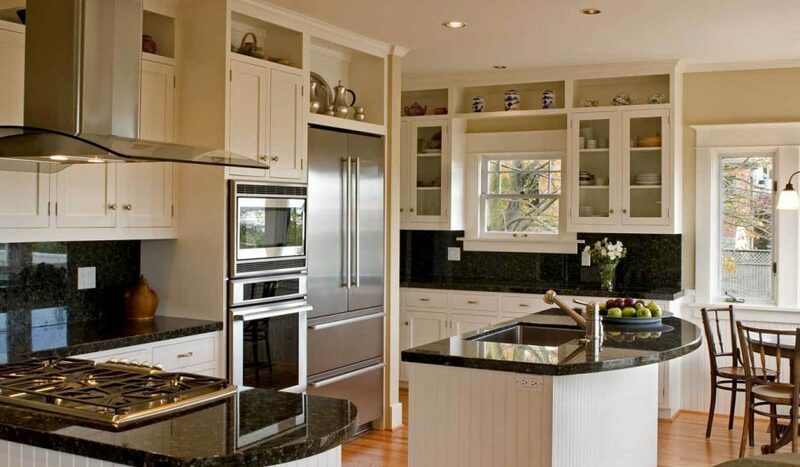 Just as mirrors can make a room feel bigger, shiny appliances can boost the feeling of depth and brightness. Same goes for sparkling floors, glass tiles, and glossy cabinets. If your kitchen is super small, it really is wise to invest in several multi-functional pieces that serve multiple functions and provide additional storage or workspace in your kitchen.